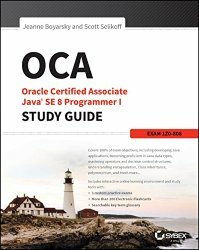 Jeanne Boyarsky and Scott Selikoff’s OCA 8 (or 11) study guide can be used to study for the Java Foundations exam. The book, OCA: Oracle Certified Associate Java SE 8 Programmer I Study Guide: Exam 1Z04-808 is published by Wiley Publishing. We are using this blog to publish information about how to use the book to study for the Java Foundation exam. See our OCA page for more details including errata and how to contact us. If you are using an OCA book to study for the Java Foundations exam, it will contain most of what you need to know. There are a few extra topics. We have blog posts including sample questions to cover this extra material. 2.1 Describe the Java Development Kit (JDK) and the Java Runtime Environment (JRE) There’s not much to this. The javac command is used to turn .java (source) files into .class (bytecode files). The javac command is part of the JDK. The java command is used to run .class files. It is part of the JRE. The JDK contains the JRE along with debugging tools and more.